A pair of pantropical spotted dolphins ride the bowwave of the Odyssey. How do dolphins avoid high speed collisions? This is Genevieve Johnson speaking to you from the Odyssey in Sri Lanka. 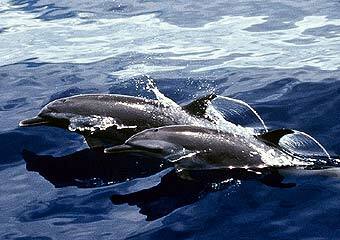 The dolphin genus called Stenella includes five closely related species: the Spinner dolphin, the Clymene dolphin, the Striped dolphin, and two species of spotted dolphin (Pantropical and Atlantic). The species in the genus show obvious similarities in body size and shape but differ by slight variations in coloration and the presence or absence of spots and stripes. The whole genus is oceanic, highly social and often sighted in aggregations numbering in the hundreds (even thousands). Of all dolphins the Stenella group is the one that most frequently approaches the Odyssey and rides the bowwave. The other day, we had a group of about 200 Pantropical spotted dolphins (Stenella attenuata) approach and bow ride. None of us ever tires of watching groups of dolphins cavorting and rolling as they travel with the Odyssey. Bowriding dolphins also always afford a great opportunity to make acoustic recordings of their clicks and whistles; that is because they are relatively close to our towed hydrophone array and because we can reliably identify the species making the sounds, and thereby reliably match the species to its sounds. We hear the clicks and whistles that the dolphins make beneath the surface through our acoustic array-the underwater microphones we tow behind the Odyssey. However, if you stand on Odyssey's bow and lean over bow-riding dolphins, you can also hear their underwater whistles through the air. A feature of dolphins we always marvel at and often comment on, is how skilled bow riding animals are at avoiding collisions with each other, even when the whole group appears to be turning at the same moment. At various times, we may have anywhere from 20 - 100 animals riding both the bow wave and the waves generated by our wake. The bow wave particularly is a comparatively small area in which to squeeze so many bodies, yet the dolphins seem appear alert to each other's most abrupt manoeuvres and never seem to collide or misjudge. This is particularly evident when you watch dolphins bowriding on the 'BOWCAM' - an underwater video camera mounted beneath the bow of the boat, that faces forward. Their swimming appears exquisitely orchestrated as they turn in apparent unison from left to right, dive and surface to breathe together, and jostle for position just ahead of the bow-each, presumably, seeking to reap the benefit of the area of greatest pressure which is immediately in front of the bow. Perhaps it shouldn't surprise us that they are so skilled at avoiding collisions since so much of their lives are spent travelling about the ocean in tight social groups. Dolphins always appear to swim in unison, diving and surfacing to breathe together. The crew often marvel at how skilled dolphins are at avoiding collisions. It is particularly interesting to observe mother/calf pairs. When young calves are about the size of an American football, they mirror their mothers' flawless swimming performances, moving with her as if they were an extension of her body. Part of the explanation of how they achieve such coordination is that if the baby presses close enough to its mother it gets dragged along in its mother's boundary layer (the water layer in contact with her body that is dragged along by it, so that it slides past and off her body at a slower speed than the speed at which she is swimming). The calf can get a further assist from the turbulence in its mother's wake, where some of the force of the water currents is forward-in the same direction the mother is swimming. If the calf can get enough of its body surface into its mother's boundary layer and the turbulent wake behind her it will be dragged along at the mother's expense, enabling it to keep up, while saving itself effort. The gain the calf gets from the mother's turbulent wake is like the assist a bicyclist gets by positioning immediately behind a fast moving truck-so-called "drafting". It derives from air that is set spinning as it closes in behind the truck, and as it swirls, part of the push it exerts to anything in its path is forward. The coordinated movements of mother and calf, make it look almost as though they were a single, larger animal. Unlike many dolphin species, Stenellas never occur alone, suggesting a strong interdependence within groups. The strong preference for such species to live in groups suggests that group life is important to their survival which may explain in part, why these species have never been successfully maintained in captivity for extended periods (as far as I know, they have thus far only been introduced to captivity as singles or pairs, rather than in large groups). So how are dolphins able to synchronize their movements? In clear water, and daylight conditions such, they probably do so by sight (tests show that oceanic dolphins have excellent sight). But how about at night, or in turbid water, or when they are too far apart to see each other? Certainly, at night they may sometimes see each other as shapes outlined by the luminescent plankton they disturb with their passage, but such plankton are not present at all times, or in all waters. And on nights of non-phosphorescence, or in murky water in the day or the night, or when too far apart to see each other, dolphins must need some kind of signal to inform them of each other's presence, orientation, speed of swimming, and changes in swimming speed and direction. After all they spend much of their lives swimming through what on land would be considered a pea soup fog. So without some such help they would run the risk of collisions, which, at the high speeds at which they swim would certainly sometimes result in serious injury. An acoustic cue that signalled speed, orientation and direction of movement would be of great value and would seem the most likely way for evolution to have solved this problem. Dolphins live in fluid social groups and produce complex frequency modulated (FM) whistles that are believed to play an important role in communication between individuals and groups. Another likely function of such whistles is that they inform other dolphins of the identity of the whistling individual: where it is, and how it is headed. 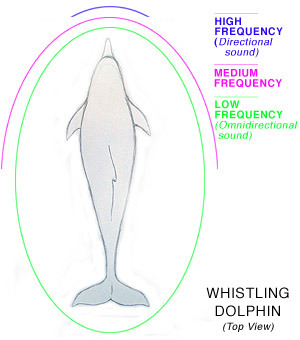 It has long been believed that dolphin whistles were omnidirectional - meaning that the tonal composition and loudness is the same irrespective of the angle from which the sound is heard Omnidirectionality excludes the possibility of listening pod members deciphering the heading of the whistling animal from acoustic cues alone. However, Marc Lammers and Whitlow Au of the Marine Mammal Research Program at the University of Hawaii, have recently investigated the possibility that the whistles of free-ranging spinner dolphins 'Stenella longirostrus'may be directional. To do this they used a towed, three hydrophone array. They found that there were high frequency harmonics present in the whistles they recorded from animals travelling with, or toward the array, but that the harmonics were softer or missing in recordings of the same animals moving ahead of or away from the array. And when whistles were recorded from animals close to the array the three hydrophones received the various frequencies in the calls at different intensities. The three hydrophones recorded the intensities of the lower frequencies in the whistles at roughly the same intensity, but the same three hydrophones recorded the higher frequency harmonics of the same calls at different intensities in each hydrophone. Until it is possible to determine the directionality of whistles directly, the simplest explanation of this result is that the whistles are omnidirectional at low frequencies but directional at the higher frequencies of the harmonics. If a whistle from a dolphin contains high frequency sound components (harmonics) the listening animal will know that the whistling animal is swimming towards or along with it. If the whistles contain no high frequency components (no harmonics), the listening animal will know that the whistling animal is heading away from it. This would be a very useful thing, because it would mean that a dolphin's whistle could convey to a listener the orientation of the whistler, and that that same listener would be able to deduce changes in the whistler's direction of swimming . The advantage of producing a sound with an omnidirectional low frequency, but directional harmonics is that changes in the loudness of an omnidirectional sound like the low frequency would not allow a listener to distinguish between an increase in distance to the signaller and a change in its orientation. However the directionality of the higher frequencies would enable that distinction. This means that when an animal in a group whistles, the highest frequencies (the higher harmonics) of that sound will be received by adjacent listeners differently depending on their orientation to the sound beam of the whistling dolphin. As the direction of movement of that dolphin changes in relation to its companions, so will their perception of the sound signal. If the whistler is moving away from them the highest harmonics in its whistles will be fading. If it is overtaking them from behind, the whistles will be getting richer in the highest harmonics. This means that as a whistler starts to turn away, its whistles will be heard to be losing their highest frequencies. So if a companion wishes to stay swimming parallel with the whistler when it can't see it, all the companion has to do is re-orientate its body to the whistle beam, until it experiences a restoration of the harmonics in the whistle to their original intensity. Having achieved that the companion will be back to its original orientation in relation to the whistler-i.e. once again swimming parallel to its chum. And it would have achieved all that simply by manoeuvering until it found a direction that restored the whistler's harmonics to full loudness. 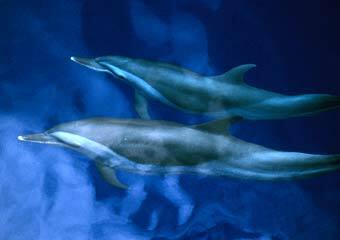 The results of the research of Lammers and Au implies that a dolphin can extract from the whistles of its herd mate information about the orientation and the direction-of-movement of that herd mate. From what we have observed on board Odyssey, this theory may explain how several dolphin species stay in touch. However, it is far too early to know for sure, so we will continue to record and document our observations at sea as we try to understand better the ways in which dolphins have learned to use their sounds. Directionality in the whistles of Hawaiian spinner dolphins (Stenella longirostris): A signal feature to cue direction of movement? Marc O. Lammers and Whitlow W.L.Au. Marine Mammal Science - Vol. 19. No.2, April 2003. Pgs 249 - 264. Read more about Odyssey encounters with dolphins: Striped Dolphins, Spinner Dolphins, and Risso's Dolphins Sperm whales, Blue whales and Risso's dolphins encounters. What did the crew report on one year ago in the Cocos (Keeling) Islands? Two years ago in Papua New Guinea?